From pumpkin and winter squashes to chili and hot chocolate, these recipes will make you feel all warm and snuggly inside in the midst of this cool, fall weather. Time to throw on a sweater, cozy up, and start enjoying some of fall’s most delicious ingredients. Don’t take any chances this year. Whip up a batch of this immune-boosting soup. It freezes and reheats well and is the perfect comfort dish to have on hand if you start to feel under the weather. It’s so flavorful and makes a satisfying dinner whether or not you’re feeling your best. Can you really go wrong with ginger and garlic chicken soup? Chocolate. Pumpkin. Muffins. I really don’t feel like I should have to say more. 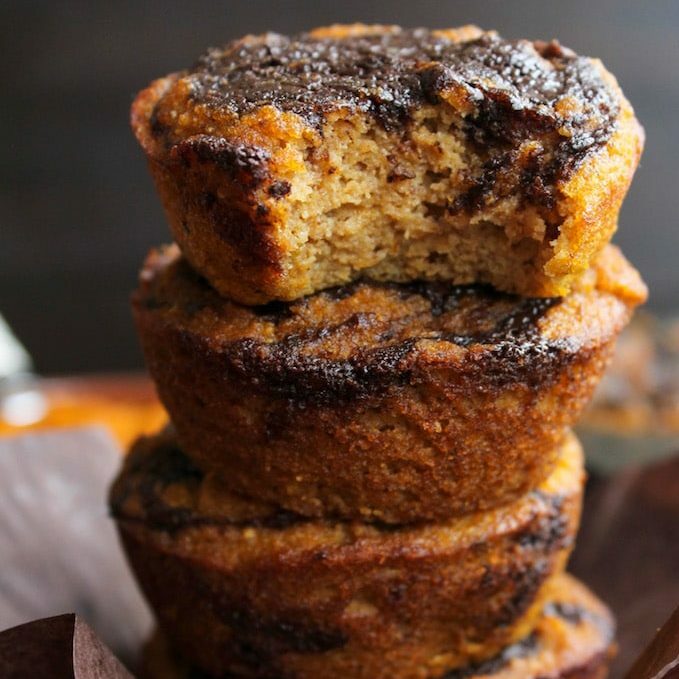 These muffins by A Saucy Kitchen are delicious! Dare you not to lick the bowl clean. Pro tip for baking with coconut oil. I melt it a little in a saucepan first, so it blends easily into the rest of the batter. You don’t want it hot, especially it you’re cooking with eggs. Just melted. Getting tired of chicken and grass-fed beef? Mix things up a bit with this beautiful roast duck recipe by the Domestic Man. The recipe calls for parsnips or turnips, but you could use whatever winter vegetables are available. I made this with kohlrabi and it was delicious. The Domestic Man’s detailed instructions remove the intimidation of cooking duck (if that’s something new for you) and make you feel like a pro chef during this tasty culinary experience. Winter squash whipped into creamy perfection with carrots, ghee, and cinnamon. So simple, and so tasty! You can mix things up by making this recipe with other winter squashes such as pumpkin and acorn squash. I love this as a side to pork tenderloin or chicken. But it’s also great for breakfast, topped with fried eggs and sliced avocado. Delish! If chili isn’t the definition of fall-weather food, I don’t know what is. Whip up this sweet and spicy crockpot chili by Cotter Crunch, grab a bowl, and curl up on the couch for game day or to watch the latest episode of Master of None on Netflix (if you haven’t seen this, it’s one of my favorites! I’ve watched season 1, three times now. Okay, I digress. Back to food.). I also love recipes where I can make one big batch and have it feed me for several days. And doesn’t chili just get more and more delicious each day, as the flavors marry together? I think so! Yeah, it’s cold. And some days I feel like it’s impossible to warm up. I love tea and bone broth, but having a little something sweet this time of year feels oh-so-cozy. Enter Collagen Hot Chocolate by What Cait Ate. 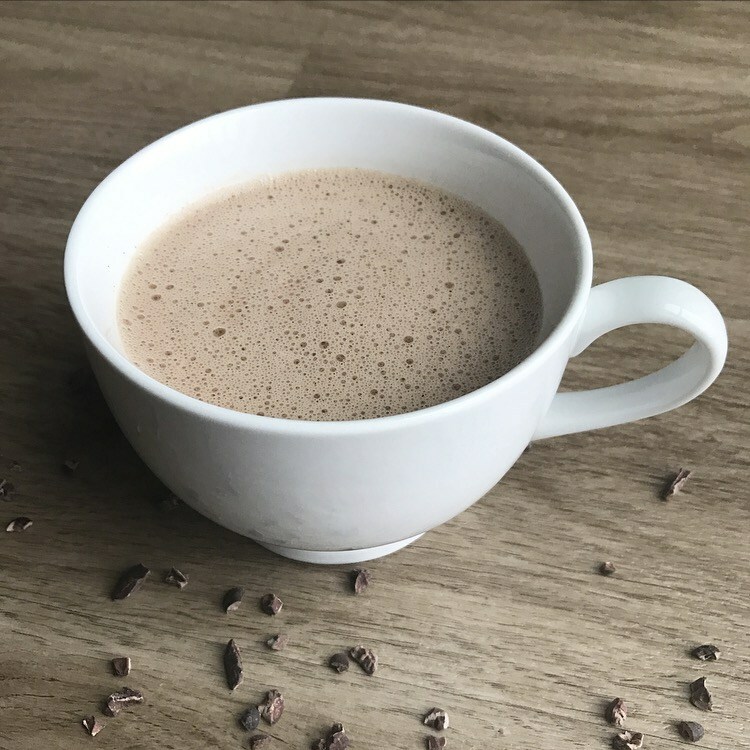 This delicious little hot beverage is full of antioxidants from raw cacao and cinnamon, with a kick from cayenne pepper! That’ll keep you nice and warm. It’s also yet another way to add more collagen to your diet. Sometimes I make this recipe with a few drops of liquid stevia, instead of the raw honey. But it’s delicious either way! Looking for comfort food? Look no further. This Buffalo Chicken Bacon Ranch Casserole by Civilized Caveman is everything you want on a cool, damp fall day. Did I mention it’s dairy-free? Yep! Thanks to the delicious Primal Kitchen Ranch Dressing, you can enjoy all the flavor of ranch, without all the dairy. Eat your heart out. 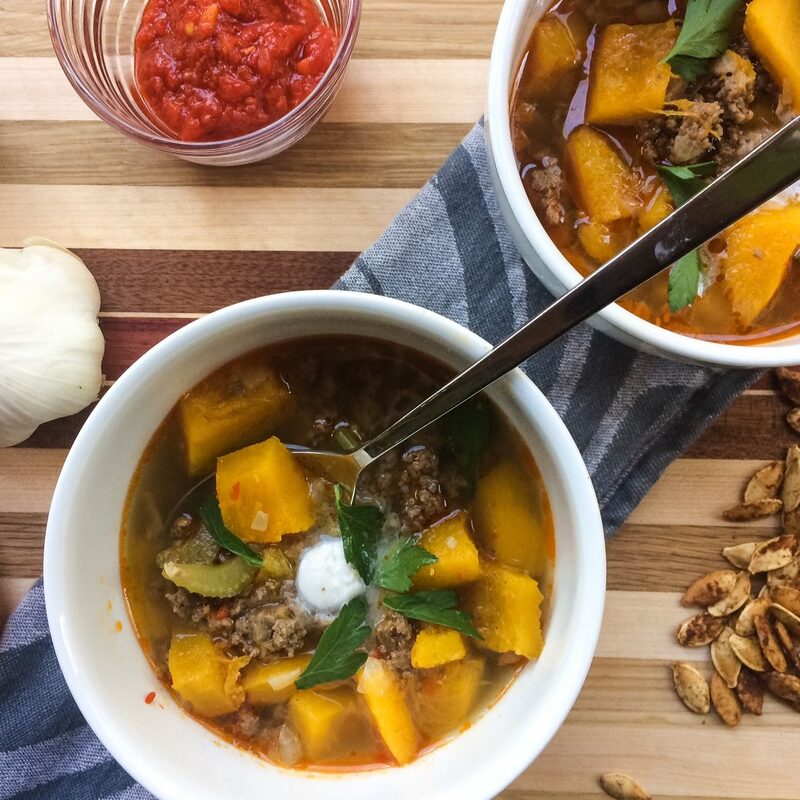 This slightly spicy beef and pumpkin soup is hearty, flavorful, and full of nutrients. It’s the perfect paleo recipe for days you’re craving soup, but want something a little heartier than chicken and vegetables. You could also use butternut squash or acorn squash in this recipe and it would be just as delicious. Top it off with some coconut cream and parsley and go to town. If you are a fan of the sweet/savory combo, this recipe from The Primal Desire will fulfill all of your dinner dreams. 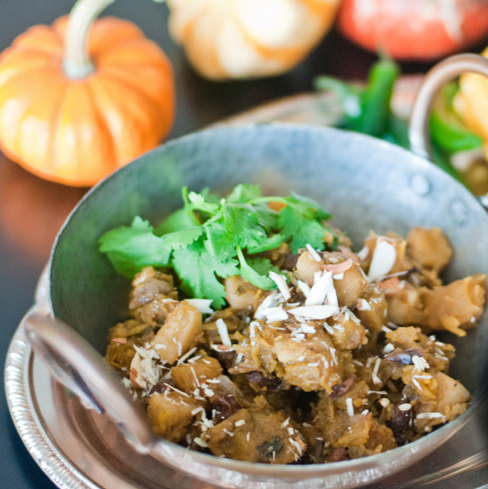 This curried pumpkin is loaded with antioxidant-rich spices, and bits of sweetness from apple and raisin. This dish works great as a side, but it’s also bold enough to stand on its own as a vegetarian main. Acorn squash is such a versatile winter vegetable and makes the perfect side to a savory dish, such as pork tenderloin. With maple syrup, cinnamon, and sea salt this acorn squash is full of flavor. Not-to-mention, sage! Yes, sage is a star in this acorn squash recipe for both its flavor and its health benefits. It’s a powerful antioxidant and anti-inflammatory and can be useful for pain management. Plus, it’s delicious! I’d love to hear from you! What are some of your favorite paleo-friendly fall recipes? Please share them in the comments below.